A large lying woman sculpture with amphora drilled for water and drapes with typical french taste. Original one design placed in the Parco Querini in Vicenza city was carved from Orazio Marinali, the Bernini's influence sculptor (Baroque style). Orazio Marinali (1643-1720), one of the best exponents of the Venetian style. Marinali was receptive to the new decorative style that "was to become popular in the 18th century, and was in charge of a successful workshop in Vicenza where his brothers Angelo and Francesco also worked. Dimensions: Height 53" x Width 87" x Deep 35 1/2"
The sculptures dimensions could be change on client request. All the sculptures are entirely carved at our Atelier by our sculptors. © All the pictures are property of the Peotta Bruno & Geom. Luigi Srl. In our workshop we produce garden statues and stone cherubs carved by hand using the same methods used by the ancient craft masters of the Renaissance who made Italian sculpture famous in the world. 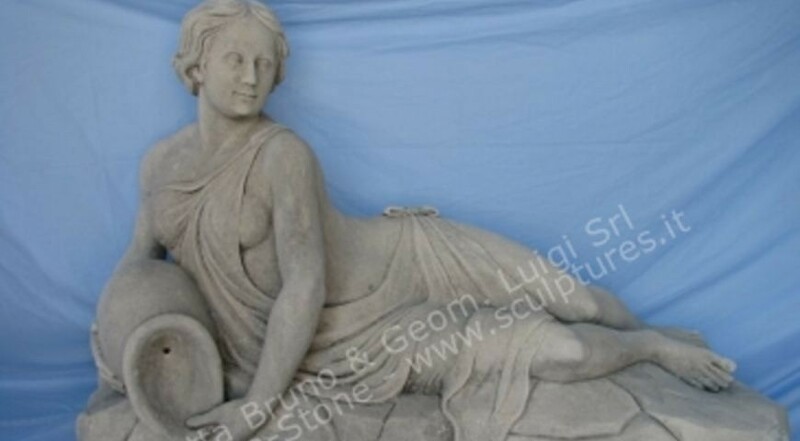 Classical garden statues in the ancient Greek and Roman styles, outdoor sculptures in the Palladian and Renaissance style, or customized subjects made ​​from drawings and sketches of customers.